Buying a website can be a stressful process, even for experienced buyers. We understand that from first-hand experience and this why we put so much emphasis on our vetting process. Our goal is to take as much concern off your plate as possible, so you can simply focus on your investment strategy and purchase the website that is the best fit for you. We try to make the buying process as smooth as possible and do that by providing you with all the information that we think is relevant upfront. What is my budget? How will I finance the purchase (all equity or use debt)? What industry? The best industries are ones you are passionate about or have extensive knowledge in. Do I want a passive opportunity (<5 hrs/week) or something that requires more involvement? If you aren’t sure, give us a call and we are happy to help you think about what the right opportunity is for you! Once you have a general idea of what you’re looking for, browse our listings and see if anything suits you! We have an extensive vetting process that we go through for every business we sell so that you can be confident in the legitimacy of the data. We verify all revenues and traffic and do more in-depth due-diligence around search engine optimization, content uniqueness, etc. You can be confident that the opportunities we list are solid businesses with great growth opportunities. You can read more about our vetting process here. We make this easier for you by building an in-depth “Information Packet”. You can click here to see a sample of what our information packets include. While we take a lot of work off of your plate throughout this process, we cannot make any guarantees (for legal reasons), so it is extremely important that you conduct your own due diligence process and develop your own investment thesis prior to purchasing. During this stage of the process we will provide you with our info pack, access to Google Analytics and access to our team to ask any questions you have about the business prior to making an offer. Once you make an offer, we will provide you with access to the back-end of the website to view any necessary reports, and will give you full access to the seller to ask any questions you may have. An offer represents no guarantee to buy the business, therefore, once an offer is made and the seller accepts it, a purchase agreement must be negotiated and executed. The purchase agreement commonly includes things such as: purchase price, assets to be transferred, post-sale training, etc. While we are happy to provide you with a template for the purchase agreement, proper legal advice should be sought. While this process sounds intimidating – don’t worry, it is usually a smooth and easy process for smaller website purchases! Once you execute a purchase agreement with the sellers, you will need to deposit the agreed upon sales price into an Escrow transaction. Our team will be the third-party manager of the transaction and will facilitate the transfer of the funds per the purchase agreement. The cost of the Escrow service is below 1% for most transactions, and is usually split by both the seller and buyer, although these terms can be negotiated through the purchase agreement. 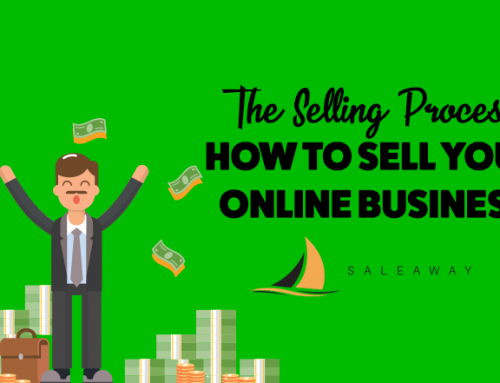 SaleAway does not charge you, the buyer, any fees for buying a website through our site. Once the Escrow is funded, the seller will begin transferring all of the agreed upon assets to you. This commonly includes: the website and all files, social media accounts, email accounts, etc. Our team won’t be directly responsible for the transferring of assets, but we will facilitate the process to make sure all assets are properly transferred and will be happy to assist where necessary. The buyer, per the purchase agreement, will provide post-sale training and support for an agreed upon time (typically 1-3 months). This gives you the opportunity to learn how the business operates and get comfortable with running and maintaining it on a day-to-day basis while still having a hand on your shoulder to help with the transition.